Have you ever taken part of a software localization project? Then you probably know that software localization won’t always be the most effortless experience. It’s no surprise that many people prefer buying professional localization services or tools rather than doing everything from scratch. Let’s go through ten reasons why software localization can be very challenging. Reactivity. Software localization is rarely proactive. Often there’s a need to localize an existing piece of software. Sadly this approach means more work. If localization were taken into account already when starting to write the first snippet of code the localization process would be much smoother. Heterogeneous. A typical localization project involves people with many different skills. The knowledge levels in different areas aren’t the same with a developer, a translator and a project manager. Thus the communication between these participants isn’t always easy. Laborious. With software localization minor changes typically require lot of work. When a typo or translation mistake is noticed on the software, the correct place needs to be found from the code, the required change needs to be made and then the software needs to be rebuilt in order to see if the correction was successful. Testing. There are many things that can go wrong in software localization. That’s why it’s wise to make a lot of tests. This takes both time and strong nerves. Finding the right people. Software is always a technical piece of art. Translation is a linguistic piece of art. Together these artists need to create a localized piece of software which enables a unified user experience among all language versions with right style and vocabulary. Combining all these elements into one project is difficult if you don’t find the right people to your localization project. The jungle of file formats. If you’ve ever participated more than one localization project you know that there are countless amount of possible file formats which aren’t compatible with each others. Project management. With all the technical, linguistic and personnel issues, software localization project management isn’t easy. File management. When there are many language versions, product versions and updates, translation memories and other files, it is possible that someone works with a wrong file at some point. Managing language versions. Multilingual software is an asset in the global markets but a pain to the localization management. Unfortunately this pain won’t go away after the project is finished. Every change and update to the original software will have an effect on the localized version as well. Danger of breaking it. No matter what you do or how careful you are, there’s always a chance that after the localization process the software won’t work correctly anymore. Finding the error may be far from simple. These ten reasons are just a start. 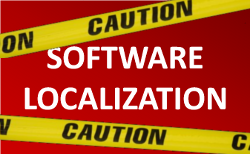 For sure, there are many other things that often drive software localization project participants crazy. Share your own experiences by leaving a comment below. Looking for a simpler way to localize software and apps? Professional software localization tool can prevent many technical problems and ease the project management. Try Multilizer Localization Tools with a free 30-day evaluation.